Why you need a mini skip in your life! Home / Rubbish Removal Blog / Why you need a mini skip in your life! Do you need a helping hand to get rid of your household waste? 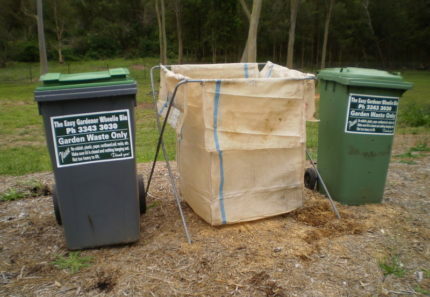 Before you jump into hiring a skip bin, I would like to point you towards a better alternative – mini skip bins. If you haven’t heard of mini skips before, they’re exactly like standard skips, except that they are smaller in size and feature some great improvements in design. As a professional supplier of mini skips in Brisbane, I will list out some of the reasons why mini skip bins are far better than standard sized skip bins. You don’t need to be renovating your home to hire a mini skip – you can simply clean out your garage, clear out fallen palm fronds or get rid of garden waste with a mini skip. After reading this article you’ll surely think why you haven’t hired a mini skip earlier. Customers often ask if our smaller mini skip bins provide any benefits over larger sized skips. The answer to this is yes – a smaller size means that we can position a mini skip close your home. Quite often, the larger skip bins that offered by other skip companies cannot be placed in difficult to access locations. Also, a smaller skip requires a smaller truck for transportation. Therefore, there is less chance of any damage to property when we deliver or collected our mini skips in Brisbane. As I often state to customers, hiring mini skips makes it incredibly easy to get rid of waste. Believe it or not, a mini skip will make the tiresome job of getting rid of unwanted waste a lot less daunting. 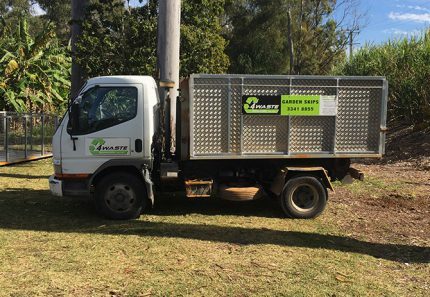 Our unique mini skips feature a rear hinged door which you won’t find in any other skip bins in Brisbane. This allows you to walk or wheel in heavy objects without injuring yourself trying to lift items over the high walls of the larger standard skips. Another great reason for you to choose a mini skip over standard skips. 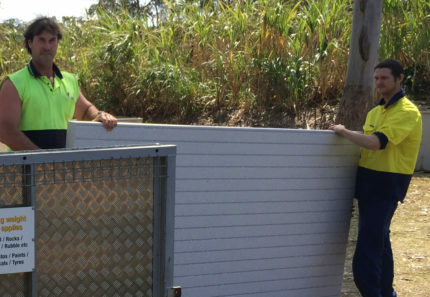 Finally, our mini skips in Brisbane are far more affordable than standard size skips – and this often surprises customers. Standard skips are available in a range of sizes and choosing an appropriately sized bin can be confusing. If you underestimate the amount of waste you have and opt for a small bin, you may very well have to order a second skip which will be heavy on your pocket. Also, if you opt for a large bin, no doubt it will be able to collect all your waste, but you will need to pay extra for the larger size. You won’t face any of these problems with the mini skips we offer in Brisbane. Our skips are available only in two variants – a 6m³ fill and an 8m³ fill level, making the choice much simpler. Moreover, with our skips, you only need to pay for the amount of space you consume with waste and not for the entire bin size. This makes our mini skips much more affordable than any standard skip you can hire in Brisbane. 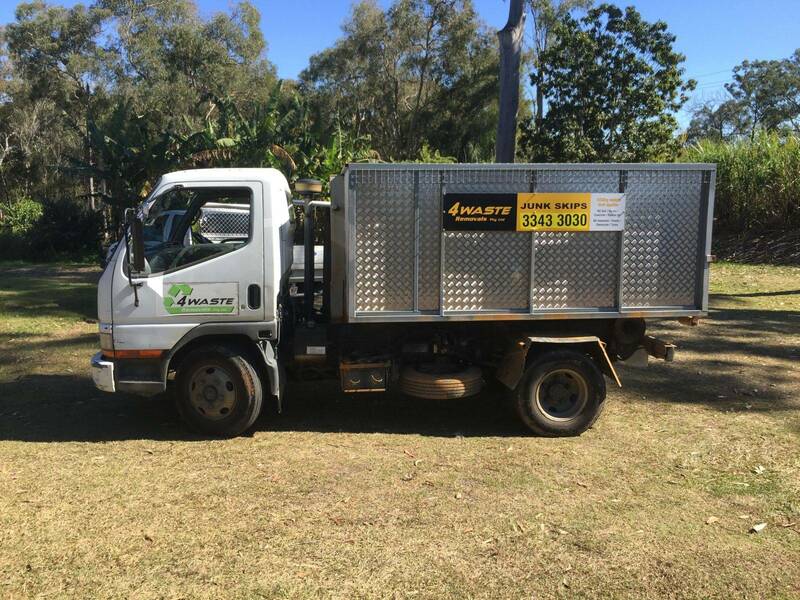 4 Waste Removals is a reputed supplier of mini skips in Brisbane. Having been in business since 1999, we have built up our expertise in offering reliable and affordable waste removal services. From garden waste, construction waste and general household waste, we can take care of disposing all your garbage from you. Our unique mini skips, coupled with our rubbish removal experts makes us one of the best waste removal companies in the area. Check out the two types of mini skips that we offer – garden skips and junk skips to see what suits your needs the best. As opposed to standard skip bins which are supplied by so many companies in Brisbane, mini skips are a far better alternative. The smaller size of mini skips allow them to be transported anywhere with ease. Mini skips feature a unique design with a rear door for entry, making it extremely easy to get rid of waste. Finally, with our mini skips, you need to pay only for the amount of waste you fill, unlike a standard skips where you need to pay for the entire bin. This makes mini skips far more affordable. 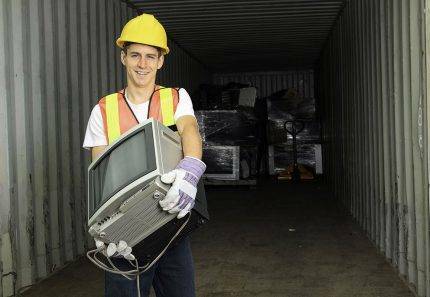 For the best mini skips in Brisbane, get in touch with us at 4 Waste Removals. We offer same day skip delivery all across Brisbane Southside and our service is prompt and reliable. Give us a call at 07 3343 3030 or order your skip online to get rid of your waste easily and effortlessly.